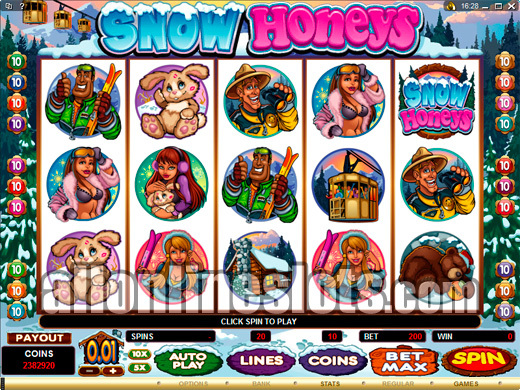 Snow Honeys is a winter theme slot by Microgaming. It has 20 lines with a max bet of 10 coins per line. The Ski Lodge and Castle symbols award the bonus games with both free spins and the Hide and Seek bonus feature. 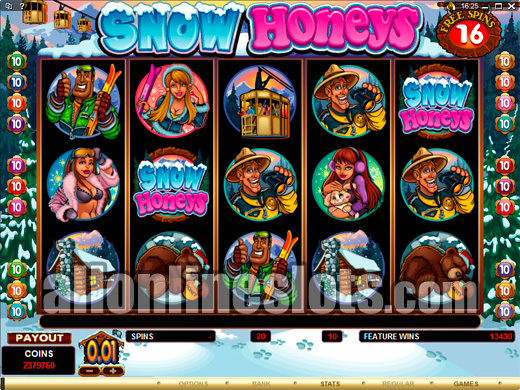 Snow Honeys is a five reel, twenty line video slot with two bonus features. It is found at online casinos that use Microgaming software and has a max bet of 200 coins. Coin sizes to choose from range between 1c and 50c so max bet is between $2 and $100 per spin. As you would guess from the name, Snow Honeys has a winter ski theme with lots of ski related symbols including several girls, a ranger, bears, a cabin and of course a ski lift. In a rare twist there is no wild symbol on Snow Honeys so all wins must be of the same symbols. Top jackpot during regular play is 4000 coins multiplied by your line bet (Up to 10). To win the top prize you have to line up five of the Snow Honeys logos on any active line. Second highest line pay is 1000 coins for five teddy bears. There are two types of scatter symbols which are the Ski Lodge logo and the castle bonus. Scatters pay aligned left to right only and each of the scatter symbols activates a different bonus. Five of either scatters pay 100 times your bet or 20,0000 coins at max bet. Hitting three or more of the castle scatters awards the Hide and Seek Bonus Feature. Once activated you move to a second screen where you have a castle with 12 windows and a rabbit sitting out front. You get from three to five picks depending on how many scatters you activated the feature with. Simply click windows to reveal your bonus prizes (View Screenshot). The second bonus is free spins. Hitting three or more Ski Lodge scatters awards free games. The highest amount of free games you can win is 30 free spins with wins multiplied by five. With this multiplier the top line jackpot grows to a nice 200,000 coins. On the free games there is actually a bigger win of 400,000 coins available as some bonus pays are added for the scatters. Getting five castles on the free games pays 200 times your bet or a big 400,000 coins with the five times multiplier - definitely one to watch for. Snow Honeys is another great game from Microgaming. It has two bonus games and some really big jackpots possible during regular play and even bigger ones during the free games. If you like the ski season then this could well become your favorite online slot.